The #44 Generation AMR SuperRacing Aston Martin Racing V8 Vantage of James Holder and Matt George was certainly quick out of the blocks this morning for the first two Free Practice sessions for this weekends inaugural GT4 International Cup in Bahrain. 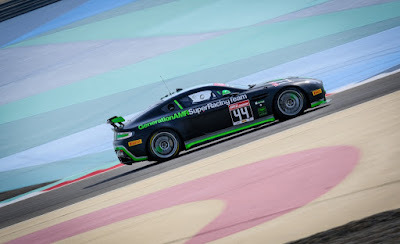 Setting some very credible lap times, the sole AMR at the event featured P2 and P3 respectively in the two sessions, down no more than 0.46 and 0.63 to the early pace setters under the warm desert sun at the Bahrain International Circuit. Qualifying this evening under the floodlit circuit, duo Qualified P18 and P11 for the two Qualifying races tomorrow with each driver setting their own time for the respective race that they will start. Race 1 will start at 10.00hrs local on Saturday, race 2 later at 14.45hrs local before the GT4 finale in the evening under floodlights. 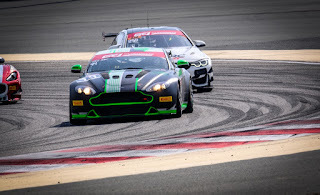 Race 1 will certainly be a bit of an uphill struggle but the teams performances of the year in the French FFSA GT Series has showed that a lowly qualifying doesn't necessarily count them out come the race.